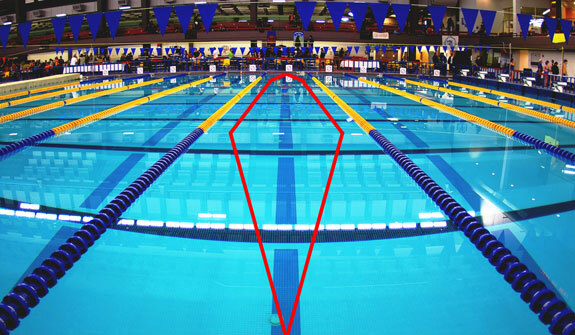 The shortest distance between two points is a straight line so you’d imagine that a direct route from one end of the pool to the other would be the selected option for swimmers in an Olympic race. Not so; many competitors in the 800m and 1500m in London were seen to be circle swimming, up one side of the lane and back down the other, probably as a consequence of the countless hours spent doing just that in training. This adds to the distance swum and while the difference over a single length is small, it adds up over the duration of the race. Those watching the BBC coverage will have heard Andy Jameson and Adrian Moorhouse discussing this issue. You may also have seen pullbuoy tweets indicating that circle swimming makes 800m into 805m and 1500m into 1509m. Here’s how those numbers are derived. As lanes are 2.5m wide and the flags are 5m from the wall, it then becomes a simple matter of Pythagoras to calculate the distance swum as 10.3m from flags to flags instead of 10m i.e. an extra 0.3m per turn. Hence the extra distance swum over 800m is 4.5m and over 1500m 8.7m. Now this is a fairly crude estimate and any distance inboard of the lane rope on the straight part of the swim will serve to reduce the additional distance swum. But even if the effect is halved, it’s worth avoiding given that finals places and even medals can be decided by just fractions of a second.